I read “Sapphire” by Jeffe Kennedy last year around this time frame, and when she announced she was releasing another book this year, I had to read it. I was a little skeptical at first when I began reading it. At first, I was not interested in it and thought I would put it in my pile of “do not finish” books without reviewing, but I knew I had to keep reading it. In my mind, I knew I had to keep giving the book a chance. I’m glad I did. The beginning had me lost a bit on what happened to the main character, Jennifer…but in the book she’s called something completely different. She’s been put into a world that she doesn’t know anything about and she’s been considered the dangerous sorceress. She should’ve been killed, but instead, she’s to endure some horrific days with some not so great fairies, who are making life pretty difficult. She is being forced to train herself in magic and continue living in this new world that she considers Faerie. She has prices she has to pay along the way. One being humiliated and locked away and another being forced to fight a war that has no purpose. There’s also the handsome, Rogue who wants her to do the unthinkable. This book had twists and turns that I was not expecting and I was confused about what was going on until close to the middle, and I finally got what was going on. The ending is what had me intrigued though and why Jennifer (otherwise known as Gwynn, per Rogue) was in Faerie in the first place. Let’s say it has something to do with dreams and someone who needed her. Jeffe Kennedy does write some fantastic love scenes, even if it’s just flirting or somewhat flirting. 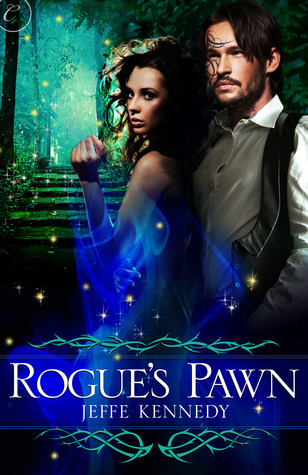 I connected more with Rogue in this story, instead of Jennifer/Gwynn. I did eventually connect with Gwynn when she finally decided to fight back. This may be not my favorite book from Jeffe, but I’m not going to stop reading her books. I want to know what happens next in the Covenant of Thorns. Plus Rogue seems like one male character I need to learn more about, and I only got a taste of him in this book. I recommend this book to anyone who loves the paranormal romance or urban fantasy genres. It is also for readers who adore fairies and different takes of them.